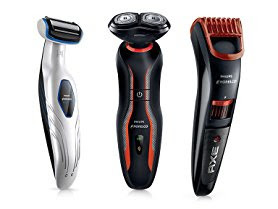 Today (5/15) only select Philips Norelco Razors start at only $27.99 (Reg. $79.99+)! Choose between 3 click-on/off attachments to get your look - Click the attachment you need onto the handle to turn it into a razor, beard trimmer or bodygroom. For a smooth face, use the razor. Use the styler attachment for stubble or beard trimming. Use the bodygroom attachment for easy and safe body trimming and shaving. Convenient and safe on skin - The dual rotary razor attachment is designed for an easy and clean shave with no nicks and cuts. Change your look with ease and precision - Create anything from perfect stubble to a neatly trimmed beard or mustache. Simply rinse under the tap to clean. Try different lengths to get the trim that suits you best - Choose from 5 length settings: 1mm for perfect 3-day stubble to 5mm for a short beard. Easy and safe body hair trimming and shaving - Rounded combs and pearlized tips prevent skin irritation for reliably smooth grooming all over your body. The handle and bodygroom attachment are water-resistant - Comfortably trim and shave all your body hair, under the shower if you prefer. Get up to 40 minutes of cordless power after a 1-hour charge - The powerful battery lasts up to 40 minutes after a 1-hour charge. A 5-minute charge gives you several minutes of running time , so you can quickly finish off. Battery light shows when battery is low, charging or full - The battery light goes on to show when the battery is low, charging or full. SmartClick system for easy click-on/off attachments - The SmartClick attachment system makes it easy to turn your Click&Style into a shaver, beard trimmer or bodygroom. Just click the attachment you need onto the handle to complete your style. Cut the hair to any length you like with the adjustable comb - Get anything from stubble to a full beard with the built-in comb. It has 20 lock-in length settings to let you create and maintain your chosen look. High-performance trimmer styles precisely and accurately - The high-performance trimmer gives you the style you want with precision, accuracy and ease. Detachable head for easy cleaning - The detachable head is waterproof for easy cleaning. Just rinse it off under the tap when you're done. The light on the adaptor shows when the battery is charging - The light on the adaptor is green when charging. Rechargeable: up to 45 minutes use from one charge - The powerful battery lasts up to 45 minutes after a 10-hour charge. Total body trim and shave - Safe and comfortable for underarms, chest & abs, back & shoulders, groin area and legs. 50 minutes cordless use after 8 hours charging - The battery lasts for 50 minutes after 8 hours charging. Battery light indicates the battery status (low/ full) - Battery light glows green when the battery is full, and blinks orange when 10 minutes remain. Trim and shave head shaves longer hairs in a single stroke - One stroke gives you a skin friendly, comfortable shave across all body areas..
Water resistant for use in the shower, and easy cleaning - Trim and shave in comfort, in or out of the shower, wet or dry. To clean, you can simply rinse this groomer under the tap. Aquatec: refreshing wet shave with foam or an easy dry shave - The Aquatec wet & dry seal of the groomer lets you choose how you prefer to shave your body. You can get a comfortable dry shave or a refreshing wet shave using a shaving gel or foam for extra skin comfort. Hypo-allergenic shaver & pearl tips prevent skin irritation - A hypo-allergenic foil shaver and patented pearl tips prevent skin irritation, providing a reliably smooth body grooming experience. Stand for charging and easy storage - Designed to fit into even the smallest spaces, so you can charge where you want, or take it with you when you travel.